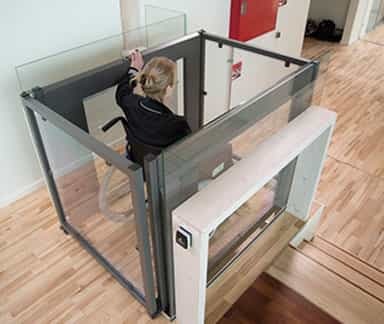 THE CONVERTIBLE 2-IN-1 SOLUTION SAVES A LOT OF SPACE COMPARED TO BOTH STAIRS AND A LIFTING PLATFORM. THE FLEXSTEP IS EASY TO INTEGRATE DUE TO A WIDE RANGE OF DESIGN OPTIONS AND CONFIGURATIONS. 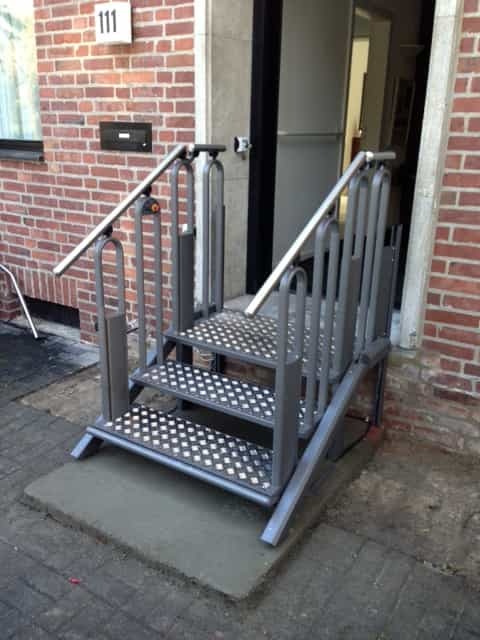 FlexStep is the perfect solution for wheelchair users and walking-impaired persons who have to overcome level differences, especially where space available is limited; this 2-in-1 product combines staircase and lifting platform the optimum way. 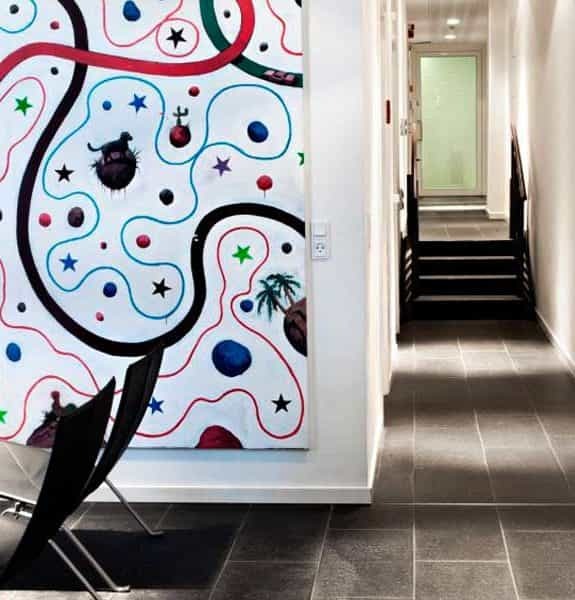 The most space-saving lift available in the market and even in a design that accommodates the most discerning taste. 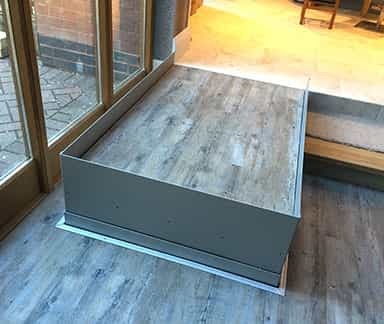 Responding to the market’s demands with regards to usage of space, functionality and safety, the FlexStep will fit elegantly into every building. 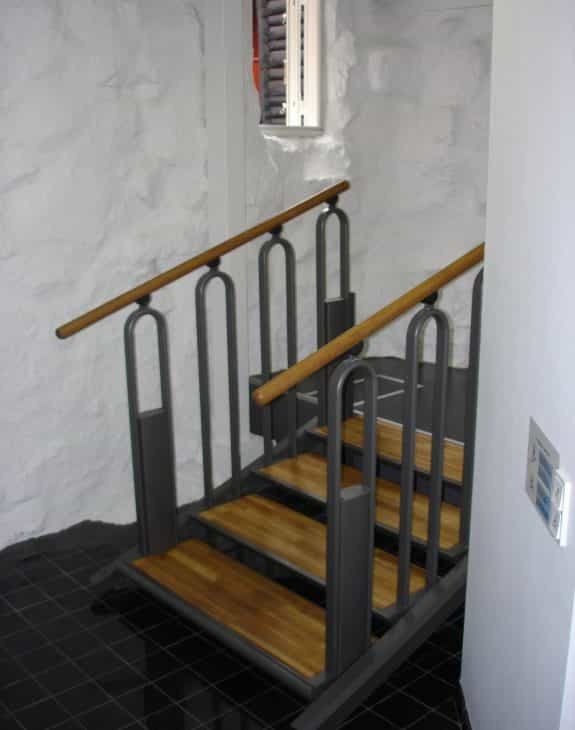 The FlexStep is delivered in powder coated steel combined with steps and handrails in materials to match their modern or traditional environment. The FlexStep operates through four linear actuators. An advanced control system ensures a perfect synchronous and smooth movement. The FlexStep is equipped with a special safety circuit, roll-off protection, squeezing, fault operation, and infrared movement sensors, ensuring no accidents will happen during vement of the FlexStep. If any one of these safety features is activated, the FlexStep will immediately stop moving and an alarm will sound. Using the FlexStep is extremely simple. From upper or from lower level the staircase can be changed to a lifting platform and movement up and down is operated on the panel on the lifting platform. All safety functions are controlled automatically. 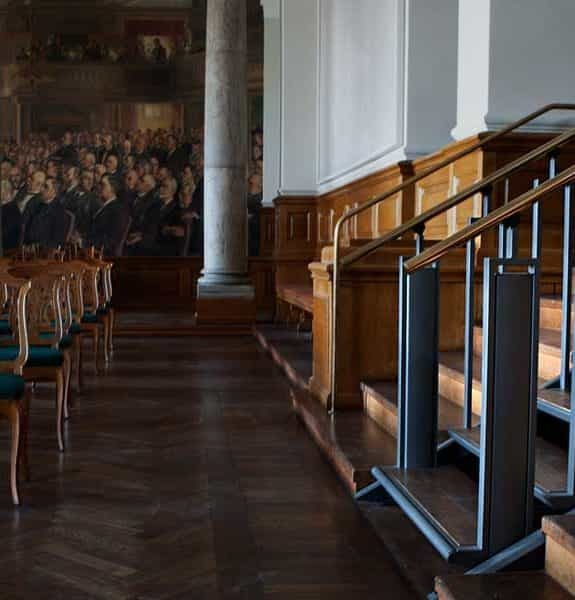 The FlexStep Compact returns to position as staircase when not operated after a predetermined amount of time. The Control unit is the "heart" of the FlexStep and it contains software which controls the safety features and lift positions, batteries which supply the system with power in case of power break down and connectors for power “in”, 4 actuators and call stations/remote receiver. The 3-step FlexStep model is intended for travels up to 555mm. With the 2 top stop software the max travel is 740 mm. Model 3-SHORT is fitted with only 915 mm platform length allowing it to be installed in areas with virtually no room for a lift! Domestic use only. Model 3+1 comes with a platform length of 1250mm. This will allow the unit to be used for public access in most places. Lifting capacity V1/V2 250 kg. / 400 kg. 2 prs. Duty cycle V1/V2 2 min. / 18 min. or 2 min. / 5 min. The 4-step FlexStep model is intended for travels up to 925mm. Travels higher than 740mm requires the space saving “2-stop point” feature where the upper step on the FlexStep staircase is lower than the upper threshold and the threshold is actually step no 5 on the staircase. The 4-step model has a platform length of 1220mm. The 4+1-model has a platform length of 1495mm. The 5-step FlexStep model is intended for travels up to 1110mm. Travels higher than 720mm requires the space saving “2-stop point” feature where the upper step on the FlexStep staircase is lower than the upper threshold and the threshold is actually step no 6 on the staircase. The 6-step FlexStep model is intended for travels up to 1250mm. 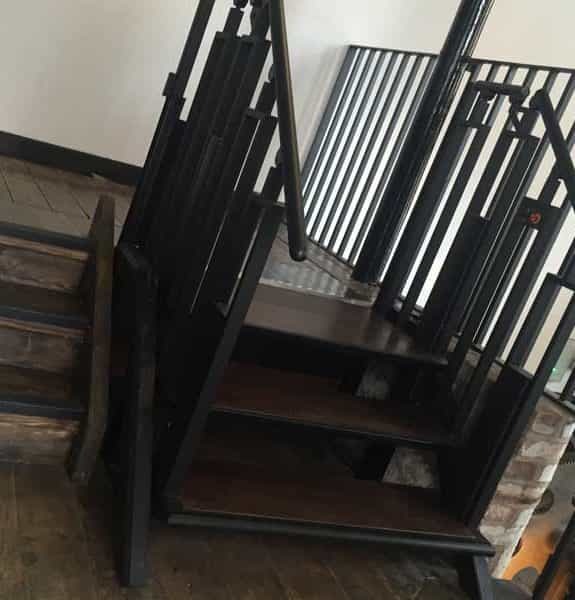 Travels higher than 1110mm requires the space saving “2-stop point” feature where the upper step on the FlexStep staircase is lower than the upper threshold and the threshold is actually step no 7 on the staircase. The 6-step model has a platform length of 1830mm. Number of steps: 3 to 6 available. – Software which controls the safety features and lift positions. – Batteries which supply the system with power in case of power break down. – Connectors for power “in”, 4 actuators and call stations/remote receiver. Vertical barrier at the upper level. 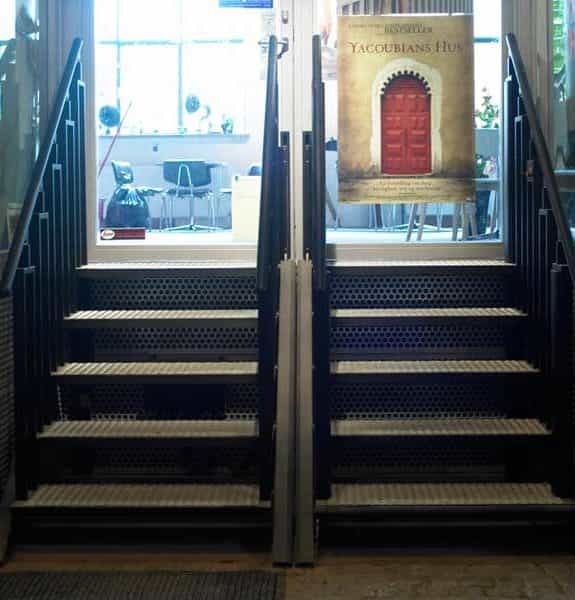 Double doors at the upper level.